Oats were arbitrarily removed from the CWB in 1989. All sorts of slippery statistics to cover up the resulting disaster have been circulated. Please let this farmer explain how it really worked in my area. 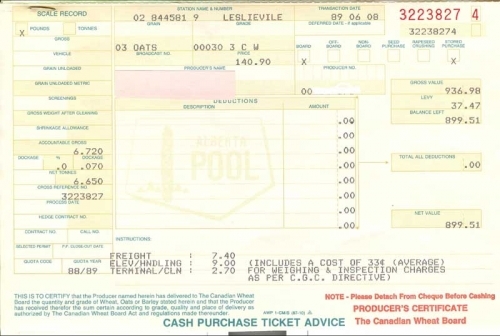 At the Leslieville, Alberta Pool elevator, oat prices immediately dropped from the CWB’s initial price of $140.90 per tonne in June of 1989, (with a later final payment of around $45 per tonne from the CWB) to $67.02 on the new private market that September. 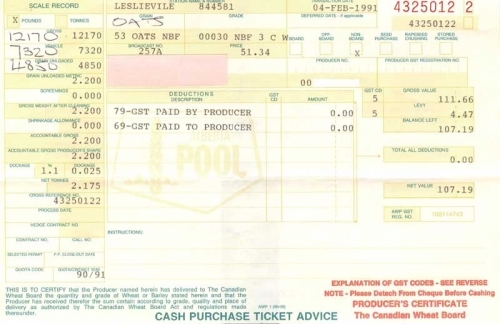 By February of 1991 oats had dropped to only $51.34 a tonne. This is a disaster that played out across the prairies. The background to this disaster is instructive for farmers contemplating how they will vote in the current CWB directors’ election. It was almost seven years, after a radical decline in oat acreage and other international factors, before prices recovered to something like what the CWB had gotten for farmers. At the end of that seven year period three big things happened which helped the development of oat processing in Saskatchewan and Manitoba, and oat exports into the United States. None had anything to do with the private market. Worse, none of them did much for farm gate prices. First, the 1989 crop year saw the results of a reduction in U.S. government subsidies for oat production and an increase in subsidies for other crops. During the 1990s U.S. farmers dropped their oat acreage about 75% to the lowest level since 1865. This opened the door for more Canadian and European oats. However, without the CWB to promote Canadian oats, our share of the US market declined, and the European Union took most of the new sales to the U.S. Prices really did not respond positively, partly because of very high European Union oat subsidies. Ten years later, EU subsidies peaked in the 1998-99 crop year at around $70 US per tonne. As they slowly dropped to near zero by 2002-03, oat prices rose in North America. More than anything else, this created the bubble in oat prices. Incidentally the EU still subsidizes oat production. With the USFDA announcing oat consumption could lower blood cholesterol, the market for human consumption oats more than doubled. But this was not a strong enough push to keep prices up in the face of farmers competing with each other to sell oats and continued European Union overproduction. The changes in Canadian oat acreage are usually overstated. According to Stats. Can. Canadian oat acreage only increased about 7% after oats were taken off the CWB. The value of oats, FOB Edmonton the week of November 30, 2011 is only $150.00 per tonne. This is less than in 1989 when oats were the responsibility of the CWB. Hardly an improvement when freight rates have gone up by 432% from $7.40 a tonne in Alberta to $32. This shows those rosy export dollars are going to the private trade, not to farmers. Oat processing on the prairies moved from Alberta to larger plants in Saskatchewan and Manitoba. Processing capacity increased by a factor of five from 477 tonnes per day in 1987-88 to 2,260 tonnes per day in 2001-02. In 1997 the United States Food and Drug Administration, allowed processors to make the health claim that oats lowered blood cholesterol levels. This effectively doubled the consumption of oats, yet prices remained flat for farmers because they competed among themselves and bid down prices and there were European subsidies. The Canadian dollar traded at a substantial discount to the U.S. dollar. So the lessons from oats seem clear. If barley goes off the CWB, say good bye to malt barley premiums. Without the CWB pushing barley sales, our European and Australian competitors will take many of our export customers just as they did with oats. The Europeans are still subsidized and the Aussies don’t have the Rocky Mountains to deliver their grain over, so their delivery costs are lower. Without the price premium the CWB brings home, especially on two row malt, you can bet returns to farmers will decline along with acreage. The idea of backyard or community ethanol stills is just not economic in the age of bigger is better. Without the CWB’s malt barley premium, feed barley producers should start praying for a miracle to keep prices up. In the end, without the CWB, barley producers will be captive, like oat producers and cattle producers, to a couple of world scale processing plants serving only a North American market. If barley producers are tricked into throwing away their direct access to the world market through the CWB, they can be confident the private trade will play them off against each other to secure their own profits, and Canadian farmers will end up as bit players in the global market. That is just the way the real world works, and the private trade’s self-serving and slippery statistics can never change that.